Alaska Dream Cruises operates three small ships sailing out of one of three southeast Alaska ports. Depending upon which itinerary you choose, Alaska Dream Cruise will begin and end in Sitka, Ketchikan or Juneau, AK. There are seven cruise itineraries to choose from ranging from 4 to 13 days in length. Each of the itineraries offers an entirely unique experience. There will be Glacier Bay on one cruise, the Tlingit Indian Village of Kake on another and Petersburg, Alaska’s Little Norway can be experienced on a couple too. The three small ships from Alaskan Dream Cruises below are not exactly small in size but will greatly limit the numbers of passengers to make your voyage much more personal. 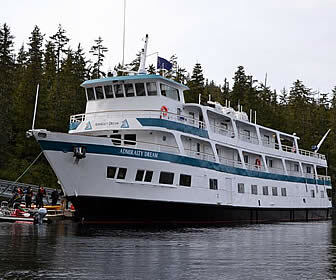 Alaskan Dream Cruises offers a variety of small ship Alaska cruises for you to choose between. Alaska's small ship cruises offer an adventure vacation be taking you to places the larger ships just physically cannot go. All Last Minute Alaska Cruise Deals from Seattle and Vancouver are updated daily! Last Frontier Cruises has unbeatable specials on all cruise deals from Seattle. The best Alaskan cruise prices on 7 day voyages and round trip cruise deals for 2013. Unbeatable Alaskan Cruise deals and Discount Cruises updated between 9am and 5pm daily.